Coryn's into super heroes, so we got really excited about Halloween this year. I know it is early, but you want to wear your costume early and often, to get your money's worth. Coryn's going with Wonder Woman. 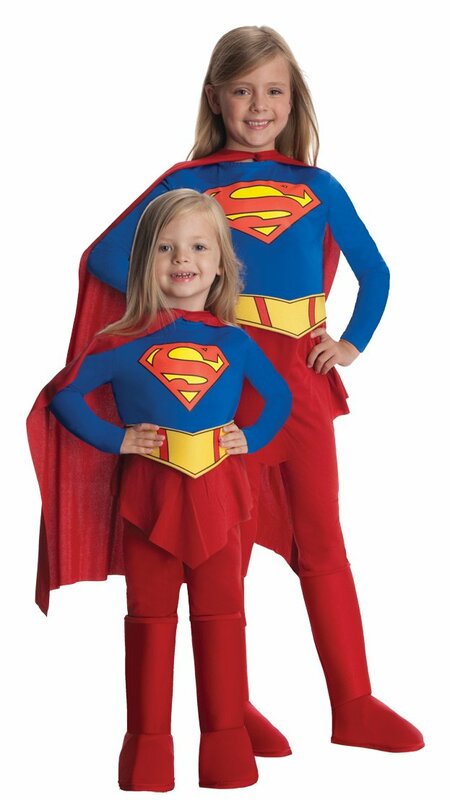 Claire is going to be Supergirl. They are both very pretty. I like the idea of wearing them early and often. It does truly makes more sense then just wearing the custom ones. yeah, I hope the costumes look as good in person as they do on the Amazon page, but either way, I'm certain my daughter is going to love to pretend play in them. She's been watching Batman cartoons from the library all week. They look ready to save the day!!! Very cute!!! Coryn keeps asking me when they'll be here. Tomorrow is delivery day. Hopefully I can post some pictures of them in costume soon. The model kids are okay and all, but my daughters are ADORABLE. Loving the wonderwoman costume. So sweet. Coryn is disappointed that it doesn't apparently come with a lasso of truth, so I'll have to figure that out. Coryn wanted her sister to be something more obscure from one of her cartoons (a wondertwin or something) but I talked her into Supergirl. There aren't a ton of good female super hero costumes out there. If all else fails I'll just tie a towel around my neck and wield a bottle brush. Coryn takes the roll pretty serious. She got her costume this afternoon and has been wearing it non-stop since then. Stopping by from the Book Review Diva hop – great costume ideas!